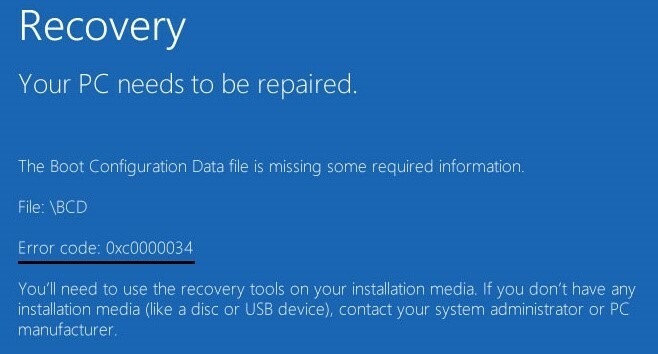 There are different kinds of error code that can occur in Windows operating system. While, each error code has a specific reason behind it, the error code 0xc0000034 often occurs due to shut down problems. Windows 0xc0000034 error code can be termed as Blue Screen of Death. It occurs when you start the computer and are unable to boot the operating system and the screen just turns blue. The error message indicates that there is a problem in the Boot Configuration Data (BCD) file. When you see the error code 0xc0000034 that means that the BCD file is damaged. There can be different reasons why this file is damaged including malicious programs, power outage and even incorrect shut down among others. This error code occurs at the time of the startup. 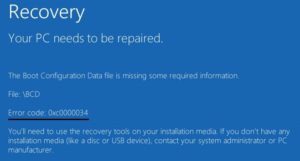 There is one solution to fix the error 0xc0000034 and for that you need to use Windows operating system DVD or USB installation disk. You need to create one on a separate computer that is connected to the internet, if the original installation disk is not available. After successful download, run this tool. This tool will ask whether you want to upgrade the operating system or want to create the installation media. Press F8 to start boot from the installation disk rather than the hard drive. The damaged BCD file should be now repaired, and you should be able to work normally on your computer.